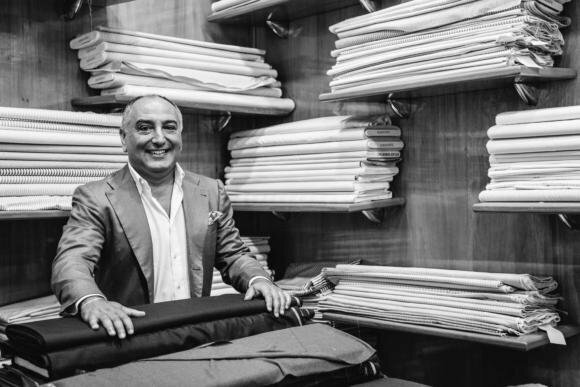 Picking cloth for a shirt can be a little tricky, perhaps even more so than for a suit. You may have an opinion on shades of grey suits, but few will have given much thought to casts of blue poplin. Fortunately, this is a good thing. 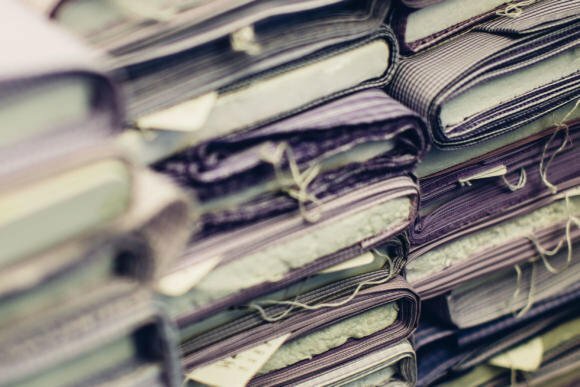 Selecting shirt cloth can be confusing because so many of the options look similar – and that’s because often there isn’t much to choose between them. Most men, at least for a formal business shirt, will want some blues, some whites, and maybe a pink. They will want – at least for their first shirts – a standard cotton that feels nice but lasts well. And the pattern of the weave is unlikely to be their top priority. But even if this is all you want, it’s worth knowing the basics, so you can have confidence in your decision and easily navigate the various bunches. Anyone that cares about the finer details will find some interesting tips here – and can then bury themselves in the details as we get into raw fibres, and the technical aspects of spinning and weaving. 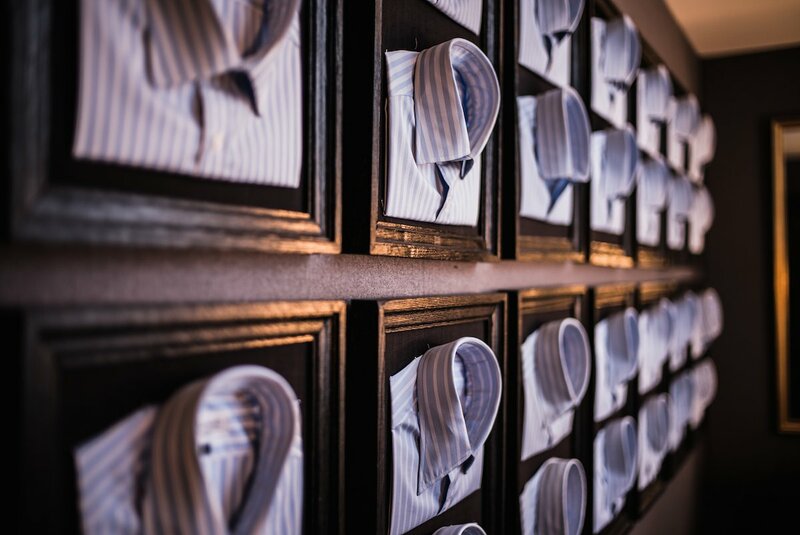 Perhaps counter-intuitively, the first thing to consider when selecting a shirt is weave pattern and formality. This is because shirt books tend to be divided up this way. There will be a book or two with casual cloths (denims, flannels, strong colours and big patterns), and then the rest will be divided by a combination of weave – poplin, oxford, twill – and fineness of the cotton (100, 120, 140). If you’re after a casual cloth, go for those books and your choice will be largely down to colour, pattern and texture. Not too many varieties by weave or fineness. If you’re looking for something more formal, you’ll need to make a choice in weave and fineness, before moving onto colour and pattern. We will go into weaves in more detail later, but the biggest difference they make is to the texture and the feel of the shirt. Have a look at that texture, to see if there is any pattern you instinctively prefer. Then feel the cloth between your fingers. Twills tend to feel richer and have a little more shine; oxfords are rawer and usually more casual; poplins are the most popular for smart shirts, and feel a little crisper. These are relatively small differences, but considering them is part and parcel of enjoying the shirting you are selecting. It’s worth doing, even if you just end up going for a poplin – the most popular and probably most versatile weave. Next, the fineness. When a shirting says ‘120/2’ beside it, this means that it used 120-count thread and two-ply yarn. Most quality shirtings will be two ply, so you can largely ignore that. The other number, the thread count, makes a big difference. 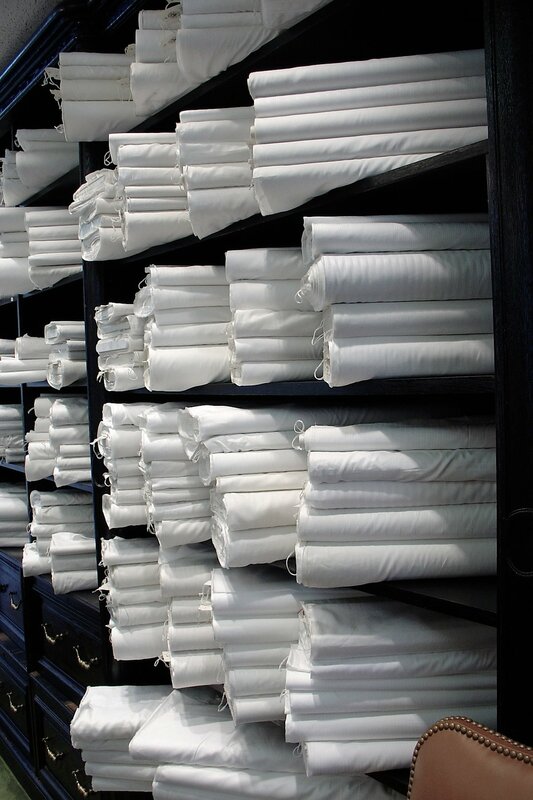 Something like 80 thread count will feel rugged and strong; a 140 will feel silky and soft. It’s up to you which feeling you prefer, but bear in mind that coarser fabrics will often wrinkle less and drape better over the day – and that’s often something men prioritise. 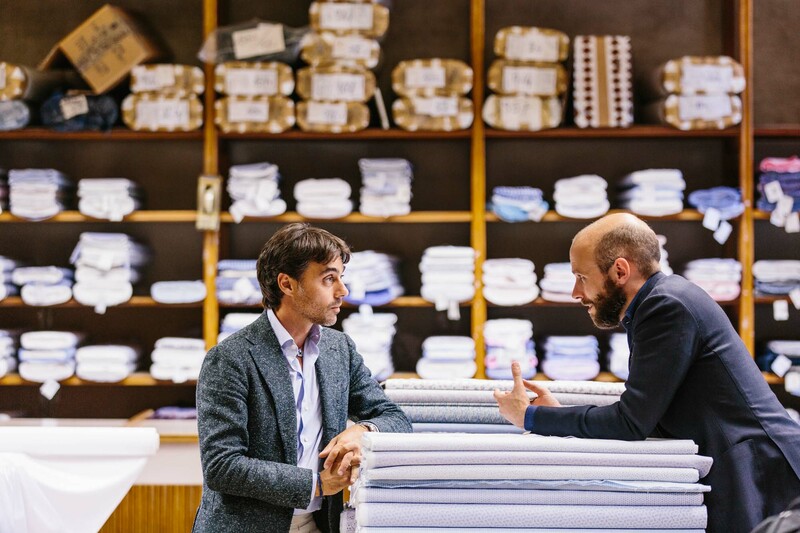 Most shirtmakers will start customers off with something in the middle, say 100 or 120. So we wanted a basic, office-ready blue and white. We’re happy with 120/2 poplin. How do we pick the colour? Whites are fairly easy. Although there are many different casts of white (and they go through fashions, like everything else) most books will offer just one plain white for a particular fineness and weave. Blues are harder. Often there will be three choices of light blue, and the selection can make a big difference. I have at least one shirt where I picked the wrong shade of blue, and rarely wear it as a result. It’s a little too strong. Only a little, but that stops it looking as good with all my ties and jackets. Second, try the potential shade against the suit, jacket or tie you are wearing. Colour can often be quite relative. You don’t realise how strong a blue colour is until you put it against something lighter – or against a light-coloured tie. Also, some of the basic advice of selecting a suit cloth applies. So look at the shirting in natural light, as well as inside; try to see the biggest swatch available; and if in doubt, see if you can take a small swatch away to compare to things at home. If in doubt, go for the lighter of the two shades you’re deciding between – any blue, no matter how light, will still be fine with a navy jacket. And stronger, brighter colours will always tend to be more casual. As I said, this is just the beginning of the journey. 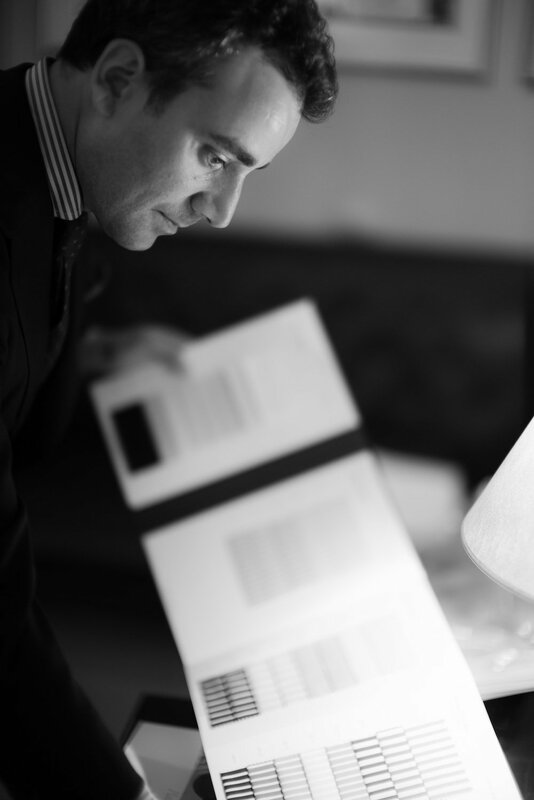 But understanding these basics should allow you to make that first, slightly surreal selection of a fine shirting. Photography: Jamie Ferguson @jkf_man except numbers 3 4, Luke Carby. You can follow the discussion on How to pick shirt fabric by entering your email address in the box below. You will then receive an email every time a new comment is added. These will also contain a link to a page where you can stop the alerts, and remove all of your related data from the site. 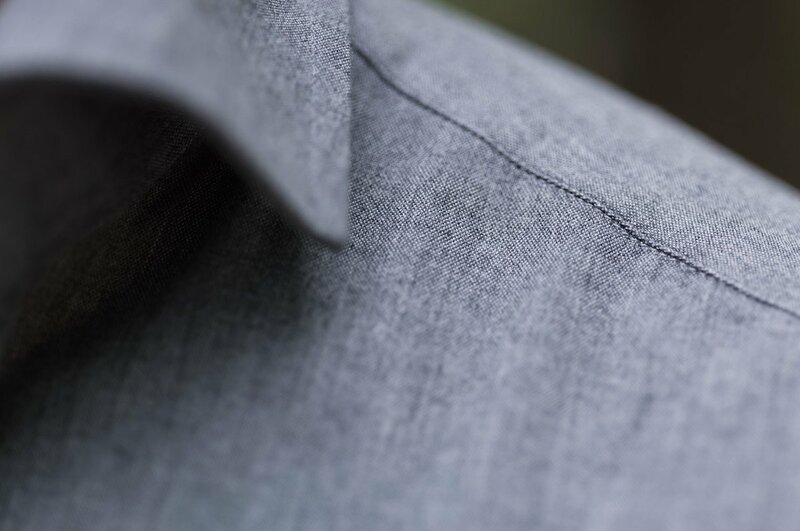 After several years of experimenting, I have found out, that the best shirt fabric for me is 100% linen. All new shirts I order are 100% linen. are you in a hot country? or this is something you just prefer. its interesting as I believe all mens shirts used to be linen, not sure why cotton became dominant, perhaps durability? Hi! Yes, even for dress shirts and even in the winter. In my opinion linen can look very stylish even with formal suits. It is a matter of being free from preconceived formality “rules” and feel what works and what not. I live in Munich which is not warmer than London. Cotton became dominant because of its cheaper price. -> It does not shrink as much as light cotton. I had to retire some fine cotton poplin shirts because at some point they became too small due to shrinkage, while other shirts with the same measurements preserved their size. -> It wears cool and thus you can keep your jacket on in situations where you would feel too hot for a jacket -> by the way this is exactly a common situation in dressier events like weddings. So what is dressier – a cotton shirt without a jacket or a linen shirt with a jacket? And above all. I like the style and this is a matter of style and preference. Also I always wear french cuffs (yes, with the linen). @Hristo Thats interesting. Would you wear a linen shirt with a heavier jacket though, like a Tweed? Perhaps this isnt your style though? Also I always though linen suffered heavy shrinkage in a washing machine. Perhaps this is to do with temp. in a washing machine though rather than how it reacts to water? Linen has more texture which actually suits tweed and flannel nicely. I wash all my shirts in the washing machine at 30 C with Perwoll and experience less shrinkage on linen compared to cotton. Out of interest, where do you get your shirts made? In the Far East? And are the collars and cuffs fused or unfused? The only problem I have ever had with shrinkage of cotton is with Oxford, which is known to shrink. A good shirtmaker should take some shrinkage into account when cutting a pattern. Also, I think washing machines are not so much the problem as tumble dryers, although good dryers now have a shirt cycle that leaves shirts still fairly damp for ironing. Shirts are the only thing I buy MTM. So they are Emanuel Berg MTM. -> The first shirts are usually wrong until they get the pattern right, which is frustrating and a huge financial commitment. Only Anna Mattuozzo got everything perfect from the first shirt, but at 350 EUR starting price(2014), it is double the cost of EB. -> Details like hand stitched buttonholes are not necessarily a plus as they are sometimes harder to iron and I iron my shirts myself. -> With shirts the consistency is very important (for example sleeve length). And experimenting with different tailors and buying their cutting experiments leads to less consistency. As my EB pattern is quite good, I am sticking with it for now. And by the way I have never tumble tried my shirts. Thank you. I have looked up Emanuel Berg as it is unknown to me. I agree about the frustration and financial commitment of a first order which is often not perfect, especially when there is a minimum order of four shirts. You are right to stick to what you know is a reliable source. And all fastidious gentlemen iron their own shirts, just as they cut their own grass! I like very much the fist photo in Caccioppoli. I think that chambray is a great noble fabric for casual or even for formal shirts. Great article and certainly the sort we need more of ! As a general rule would you always recommend a 2 ply for everyday office shirt ? Looking forward to this series as, of all menswear, shirts (closely followed by ties) are what excite me the most! Does choosing a shirting with a smaller thread count (e.g. 80) make a shirt appear less formal? Or is the effect pretty minimal? I find little difference in the feel (while wearing) high and low thread counts, but do appreciate the wrinkle-resistance of the lower thread counts, but worry the difference in drape may make them seem a little informal. It will make it look a little less formal, yes, but we’re talking about small differences. Few people would notice the difference, and certainly if you went up to a 100 count, pretty much no one would. Fascinated by your comment that the difference between oxford and poplin is relatively small. That’s just plain wrong. Both texture and weight will be very different, as is the formality. It depends who you’re talking to. There are substantial differences of course, but this is a basic guide and I bet you 90% of people in a professional office have no idea which of the two they’re wearing or notice which anyone else is wearing. But they will notice colour, pattern, superfines, brushed cottons and other textures. That’s why I say the difference between those two is relatively small. Simon, what is the shirt in the third pic please? So as a standard what would be your go to everyday white and blue shirt for the office ? Pick between twill and poplin purely on how you like the feel. If in doubt, go with poplin. And yes, 2 ply, 120 thread count. 100 is perfectly adequate and, unless you are choosing cloth for bespoke, you are unlikely even to find RTW made with 120s. The RTW market seems to sell nothing but . They do indeed. Because most men and lazy and wouldn’t notice the difference. Can you elaborate where these cloths can be obtained – at any decent shirtmaker? I like to have some non-iron shirts in my wardrobe as sometimes I just don’t have time to get into ironing if I’m overly busy at work that week (that said, the majority of non-iron shirts still need a quick once-over to look crisp). That picture of the cloth on the shelves is, um, very exciting. I have zero need for smart officey shirts. I’m well catered for with formal shirts (black tie) which I wear occasionally. What I cannot get from any of the shirtmakers I have tried are really good casual fabrics. Not one shirtmaker has ever been able to offer me really large checks (plaids and cowboy checks), corduroy of any wale, real Indian madras, thick fluffy twill, or flannels. And whenever I ask them about proper denim, they show me pale blue chambray! I now shop around for these fabrics and get shirts made CMT. But they seem much harder to find than suit cloths. Simon, do you have any suggestions for sourcing such cloth? Oh, and generally it’s a shame that the sample books have such laughably small samples stuck in them. Always better to buy when you’ve seen the actual bolt. The shirt mills are moving in that direction (eg Albini investing far more in Albiate now) but very slowly. And their cloth for big brands will always move faster than the bespoke offering for shirtmakers, which they assume is always more formal. Again, that is changing but even slower. It’s one of the reasons we did our denim cloth last year and we’ll be doing another casual cloth later in the year. Try Luxire and Proper Cloth. My name is Tim. I manage the Bespoke division of the Albini Group. Our company has been offering various denims and all kinds of fancy fabrics for Bespoke shirts. I’ve your interested, you can find them in the Fabric Butler app (available via Apple store and play store) we have developed. Please note that it’s still a beta version. Do you (or any of the other posters) have any experience with Luxire? I am interested to hear some reviews. I realise that they will not be the same quality as some of the more prestigious bespoke brands, but working in the medical profession, I would not want to wear a T&A shirt on a daily basis. I’ve had a couple of long-sleeved pique polo shirts and some OCBDs made, with largely positive results. Some initial fit issues, which they corrected free of charge twice (except for postage, of course), and after the second iteration I can now order just specifying small deviations I want for a particular shirt. The level of make is ok (comparable to my local shirtmaker, but 30-40% cheaper) ,and the cloths are good. I need your advice. What should I wear with a dark gray suit. Pale blue shirt with burgundy tie, or white shirt with dark blue tie? I can never decide. Thanks. Burgundy isn’t generally great with dark grey. Better with mid greys. I’d try a white shirt with something like a dark olive or a cream/beige colour. If blue, make it navy – very dark. I’ve used Luxire. The key is to be very careful with your measurements. I find using measurements from a shirt you already own and which fits well works best. They offer a “trial”shirt at low price in a very basic chambray which is worth doing to get the fit right before ordering something more expensive. The difficult thing with online ordering is judging the colour of the cloth. So far I’ve only ordered light blue and white shirts and they have been fine. Nice article Simon and very informative however, I must confess that having been a customer of LA’s for more than 2 years now, I’ve never given any attention to the numbers. I simply pick on what I like and need. I wholeheartedly agree with Suffolk’s comment about the swatch sizes. Quite frankly, pathetic. This is probably the single reason that stops me from ordering anything adventurous but beside that, you cannot even feel the fabric properly due to the size! Great advice. Before the shade and strength of the blue, I find more importance in the hue of the blue. In the photo of the four hanging linen shirts, the middle two shirts are approximately of the same value, but the hues are considerably different. People will usually look much better in one than the other. Thanks Matt. I guess to be clear we should separate the pure colour (which is what I think you mean by hue) from the level of saturation or mix with a neutral colour such as white, grey or black, which darkens or lightens. It is the pure colour or hue which I am referring to when I say it’s easy to pick the wrong blue. Simon, since you have been to considerably more bespoke shirt makers than I have, how many offer non-iron treated fabric or will make shirts out of non-iron treated fabric? My shirt maker doesn’t believe in them, nor do I care for them personally, but I’m curious to know considering their popularity in low- to mid-tier ready-to-wear shirts. I know some people who refuse to wear a shirt that doesn’t say “non-iron” or something to that effect on the label. Thomas Mason offers a special line called Journey. These are 100% cotton fabrics which are treated in such a way that they are wrinkle resistant and easy to maintain. So they have offer a valuable benefit but still remain high quality. 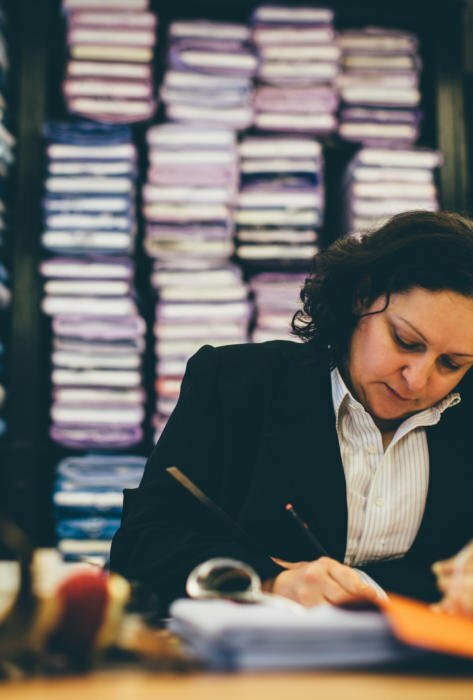 Hi Simon – My earliest bespoke shirts are starting to wear on the collar and cuffs. Have you had any experience getting the maker to replace only collar and cuffs? Presumably it would need to be replaced in white cloth? I guess I can leave it for a bit – apparently some wear is acceptable right? I actually quite like wear on at least relatively casual shirts. Perhaps not on smart, with-tie, double-cuff shirts, but on more casual ones it has a nice English country-house casual air to it. No, I’ve never replaced collars and cuffs, but it pretty much always has to be white, yes. Many bespoke shirt makers can replace collar and cuffs from cloth in the tails of a shirt. This will of course have faded at the same rate as the rest, and thus will not look out of place. When I order a shirt I always ask for extra cloth for collar and cuffs replacement. My shirtmaker recommends it so that at least we secure the cloth is from the same batch. Obviously I should take good care to have them replaced before the original colour has faded too much. Anyway, after say just one year using a shirt (average period for a replacement… Afraid got too many shirts…) and depending on the cloth there will definitely be a difference, a slight one between the shirt and the new collar and cuffs… which will vanish after a couple of washings. This hadn’t occurred to me as an option – it’s a good one and I shall ask my shirtmaker. Some shirt makers gives you the excess cloth, which can be used to replace cuffs or collar later. But the rest of the shirt might have faded, making a visible contrast, and I’ve never actually done this myself. Anyone? I imagine that if you wash the extra cloth every time you wash the shirt, they fade at the same rate. Or just get tunic shirts with two or three detachable collars and surgeon’s cuffs. You can have different collar and cuff styles for the same shirt if you want, or swap them for starched. Much easier to iron, too. Would you recommend any other colours outside white, blue and pink for business shirts? And what colour ties would you wear with a pink shirt? I always struggle on that front. Most of the time, no. Better to add in some stripes, thin and thick. Perhaps different textures like a linen/cotton mix. For those who can suffer with a sore neck, would you recommend a higher or lower thread count? Hi Simon. Have you any tips for removing sweat stains from white shirts? It’s a significant problem in the tropics and I dislike discarding shirts that are otherwise in good condition. Have you found any professionnel services who are effective with this type of stains? Not very relevant question but still about shirts. Shirt torn at elbow – this happens to me all the time. However, I normally spend 10 hours daily in my office on avesrge – mostly with elbows placed on my desk. And it is not the case that a particular brand is especially vulnerable – all tear equally often. Is it an indication of a bad fit? Or is it normal wear & tear? Hi Simon, very nice post! I had been wanting to know more about picking shirt cloth. A while back I was at my tailor’s shop and I overheard him talking to another customer about how this one guy who lived near a beach in a tropical region wanted the softest possible shirt and this guy requested a “300-count” white cotton shirt. Do cotton shirts really come in 300-count? In your opinion would this 300-count shirt be better suited to a hot/humid weather? Thank you for your opinion on that! How would you pair a pale lavender shirt? Any thoughts & experience with Albini’s St James 100/2 poplin collection for workhorse shirts?